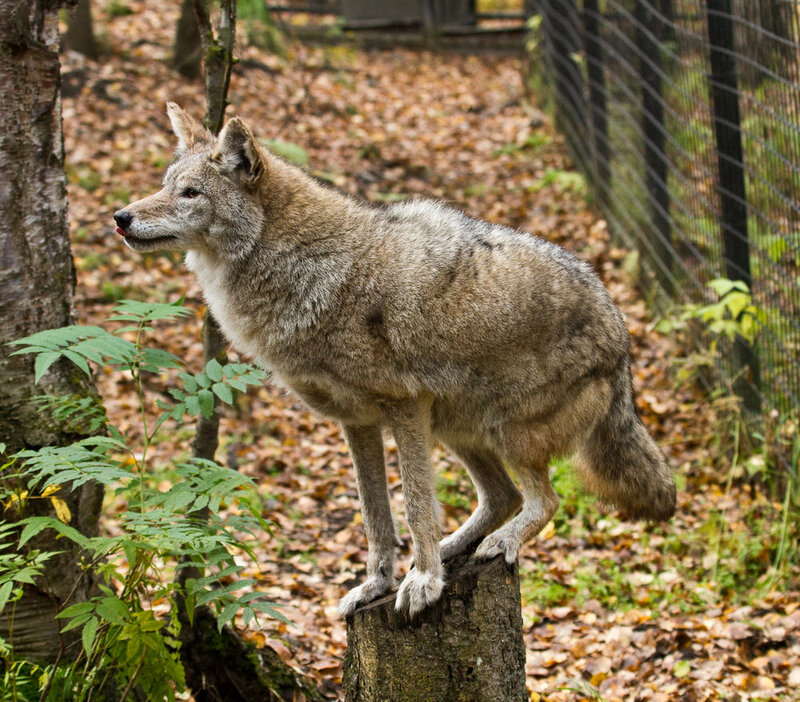 Meet Alaska's larger canids, the gray wolf and coyote. They are larger cousins to red fox and Arctic fox. Back to animal directory. LIFE SPAN: 20 years in captivity, 12-13 average in the wild. RANGE: Wolves are adaptable and live in a wide variety of habitats, from the rain forests of Southeast Alaska to the Arctic tundra along the Beaufort Sea. The wolf is found throughout mainland Alaska, on Unimak Island in the Aleutians, and on all of the major islands in Southeast except Admiralty, Baranof, and Chichagof. Different races and subspecies of Canis lupus exist in the Lower 48 states, Canada, Europe and Asia. SIZE: Adult male wolves in Alaska weigh from 85-115 pounds, but sometimes reach 145 pounds. Females are 5-10 pounds lighter than males and rarely weigh more than 110 pounds. Wolves reach adult size by about 1 year of age. FOOD: Wolves are carnivores and big game is their mainstay. They focus on caribou in the north, Sitka black-tailed deer in Southeast Alaska and moose throughout much of the state. Wolves typically hunt in groups to bring down large animals. Wolves are opportunistic and individually they supplement their diet with beavers and small mammals such as voles, lemmings, ground squirrels and snowshoe hares. Wolves also scavenge carrion and will beach comb for food along the coast. They will also catch and eat salmon when available. BEHAVIOR: Wolves are social and live in packs which are generally family groups. Packs include parents, pups of the year and often offspring from previous years. Occasionally, non-related wolves are allowed to join a pack. The parent wolves in a pack are called the alpha pair, or primary wolves. If one of these alpha animals dies, the remaining alpha wolf will accept a new mate, normally from outside the pack. The average pack size is seven wolves. Larger packs of more than 20 wolves sometimes occur and may include two or three litters of pups from more than one female. In most areas, wolf packs remain within a territory that the pack defends from intrusion by other wolves. Territorial boundaries may shift over time, depending on the abundance and distribution of prey within the territory. Territories may be smaller than 100 square miles in Southeast Alaska on islands where deer are abundant, but may exceed 1,000 square miles in Arctic and Interior Alaska where prey densities are low. Wolves are highly mobile and may travel 20 or more miles in a day. They may travel hundreds of miles when leaving their birth area to find a territory. CONSERVATION: Wolf populations appear to be stable relative to historical numbers and wolves inhabit all of their traditional range except within the largest cities. Wolves have never been threatened or endangered in Alaska. Fluctuations in wolf population size are closely tied to changes in population levels of prey animals. Wolves in Alaska are managed as both game and fur-bearing animals. To read more extensive information on the status of wolves in different regions of Alaska, visit the Alaska Department of Fish and Game site. LIFE SPAN: 19 years in captivity. RANGE: Widespread throughout most of North America. In Alaska, they are found mostly on the Kenai Peninsula, in the Matanuska-Susitna Valley and the Copper River Valley. SIZE: Coyotes weigh 20-40 pounds, 25 pounds average. PHYSICAL FEATURES: Coyotes vary in color, size and thickness of fur. They are larger than fox, but smaller than wolves. They possess behaviors of both wolves and fox. FOOD: Coyotes are very opportunistic feeders. They scavenge for prey as well as hunt live prey. Coyotes will tackle larger prey (deer) by teaming up with other coyotes and running relays to tire prey, then ambush it in a wolf-like hunting style. Coyotes will also hunt in a solitary fashion by jumping in a high arch and pinning prey under their forepaws, a very fox-like way to hunt. They adapt their hunting style to their location and available prey base. This makes them a very adaptable species with a widespread range. BEHAVIOR: Coyotes are excellent runners, in fact the best of the dog family. A coyote will run at speeds of up to 30 mph, sprinting to reach 40 mph. They are incredible jumpers and swimmers also. Their adaptable nature allows them to thrive in remote areas as well as in urban areas, although they are not found in cities or towns as frequently in Alaska as they are in the Lower 48 states. They co-exist with humans and even manage to extend their range despite encroachment on their habitat. CONSERVATION: Coyotes are common throughout their range. They are often subjected to poisoning, trapping and aerial shooting. In 1942, they were called “obnoxious animals” by the Game Commission and a bounty was put on them. This bounty was finally lifted in 1969. Coyotes are a valuable species in an ecosystem who help to keep rodent populations in check, along with other prey species. PLANT NOTES: Coyotes prey heavily on small mammals and birds, both of which rely on plants for food and cover. As the diversity of plant communities changes (ex: due to fire or logging), the variety of small mammals and birds changes. This causes shifts in the composition of coyote diets in the wild. They usually weather these changes well given their adaptable nature. Coyotes will supplement their diet with berries or plants when live prey are unavailable.